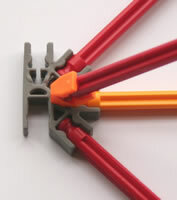 The clip with angled end is a clever little clip that is designed to fit tightly inside any one of the triangular holes near the centre of a classic K'NEX connector. This allows a rod to be connected to the end of the clip at an angle of 45 degrees to the plane of the connector. This is ideal for providing supporting legs to structures that need to be especially stable, such as roller coaster bases.